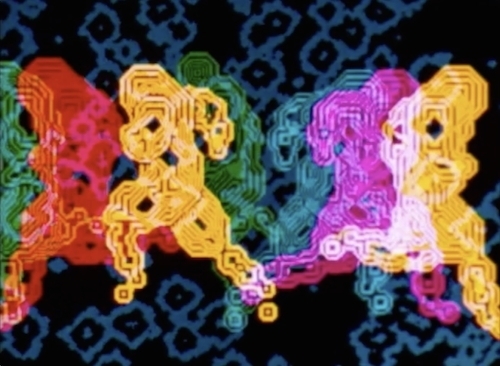 Lillian Schwartz, Olympiad, 1971, video, color, sound, 2 minutes 33 seconds. The 1970s art world was, in general, skeptical of the computer’s artistic value. Fittingly, The Artist and the Computer, a 1976 documentary on Lillian Schwartz’s work at AT&T’s Bell Labs, possesses the corny vibe of an educational after-school special. The movie alternates between clips of Schwartz’s computer-generated films and footage of her explaining the skill and artistry behind them. In one scene, she flips through a book on nineteenth-century art (before a roaring fire, naturally) and pauses for an aside on modernism’s debt to science and technology. The camera, Schwartz reminds the audience, was useful to Impressionist facture, and color theory informed pointillism. This earnest appeal to acknowledge the computer’s place within art’s unfolding history feels utterly quaint today. But the documentary, shown at the entrance to this exhibition, reinforces just how groundbreaking the artist’s oeuvre was. Perhaps it also explains why many of her films, displayed here on loops in the gallery’s basement, read as takeoffs of past artistic movements, demonstrating the computer’s capacity not only to mimic better-established art forms but to supercharge them. In Olympiad, 1971, tessellated outlines of human figures run in Muybridgean arcs. Enigma, 1972, featuring flashing bands of colored light, is Mondrian on psychotropics. And in Fantasies, 1973, circles and rectangles swirl and meet in formations that recall stained glass. Though other works pull from chemistry and biology (such as Apotheosis, 1972, developed from pictures of cancer radiation treatment), Schwartz’s ability to put a mesmerizing, often painterly spin on digital imagery is consistent throughout her work and indeed makes her a pioneer of the form.